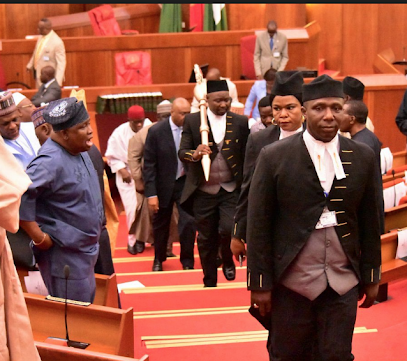 It was time to take stock yesterday of Wednesday’s invasion of the Senate by thugs, who carted away its mace, the chambers' symbol of authority. The mace was recovered yesterday and returned to the Senate by the police. Rising from a one-hour executive session, the Senate resolved to invite Inspector-General of Police (IGP) Ibrahim Idris and Director-General of Department of State Service (DSS) Lawal Daura, next week to brief it on investigations into the attack. The Senate added that it won’t be cowed by what happened on Wednesday. “I want to assure Nigerians that we will never waver in the responsibility they have elected us to shoulder. We will all stand together to defend this institution of the parliament and our democracy. We will never fear to legislate; and we will never legislate out of fear,” Deputy Senate President Ike Ekweremadu said in an address at plenary, which folowed the closed session. The Nation reports that at the Federal Capital Territory (FCT) High Court, Senator Ovi Omo-Agege got an injunction stopping the police and DSS from arresting him. Ekweremadu, who presided over plenary, said everything must be done to prevent a recurrence of the dastardly act. Issues relating to the attack; how to prevent a recurrence and ensure lasting harmony in the Senate were said to have dominated the closed session. What happened on Wednesday, he said, must not be allowed to go unpunished or to be swept under the carpet, adding that the Senate will get to the root of the matter. Ekweremadu, who read a statement entitled: “The affront on our laws and institutions must not go unpunished”, said: Distinguished colleagues, “yesterday (Wednesday), this legislative chamber, the nation, and the international community were treated to the theatre of the absurd when armed men invaded the chamber to assault our staff and cart away the mace, the symbol of authority of the Senate. It was a very sad testimony, a derogation, and total smear on our democracy and nation. “On behalf of the President of the Senate, Dr. Bukola Saraki, I want to register deep appreciation to you, my colleagues for your understanding and maturity in the face of flagrant provocation. You showed forth yourselves as patriots and elderstatesmen and women. I am indeed proud of you and salute your patriotism. “I want to also specially appreciate the leadership and members of the House of Representatives, the management and staff of the National Assembly, especially our chamber staff for their gallantry. “We appreciate Nigerians, the media, civil society organisations, the political parties, and the international community for the outpour of solidarity and concern. “Ugly and provocative as the event of yesterday (Wednesday) was, it soothes that the entire nation and the world stood together in total condemnation of the ugly drama, brigandage, and desecration of the National Assembly by those, who hold themselves above the laws and institutions of our land. “Distinguished colleagues, you would also recall that this hallowed chamber, supported by the House of Representatives, demanded that the Inspector-General of Police recover and return the stolen mace to the Senate within 24 hours. “Concerned colleagues and Nigerians, who wanted to find out if the mace had been found, have inundated me with calls and messages since last night. Let me, therefore, formally confirm to you, my distinguished colleagues, that the mace has been recovered by the police as we demanded and it is here in this hallowed chamber. “Nevertheless, we believe that there should be consequence for bad behaviour. We swore to uphold the laws of the Federal Republic and the principles of democracy. It still beats the imagination of Nigerians and the civilised world that the attackers passed through the several security checks and barriers into the National Assembly and the inner recesses of this chamber and also escaped with the mace into the thin air despite the well-known fortified surroundings of this parliament. “Therefore, we hold that it will be a detour to the state of nature where life was lawless and brutish if what happened yesterday is allowed to go unpunished or to be swept under the carpet. It will never happen. We will get to the root of the matter. We call on the Inspector-General of Police and Director-General of the Department of State Service to ensure that all those, who plotted, aided, abetted, and executed this dastardly affront on our democracy and belittled Nigeria before the international community are brought to book to serve as a deterrent to others. We will be inviting them next week to brief us on the state of the investigations. “This incident has also brought to the fore the case many of us have always made for a decentralised police system. Ordinarily, a big institution like the National Assembly should have its own police, apart from the sergeants-at-arms. However, the security of this parliament is fully outside the control of the National Assembly. Instructively, the same gangsterism that was witnessed here yesterday (Wednesday) has been recorded in various state Houses of Assembly."